I enjoy pressing my semicolon key. 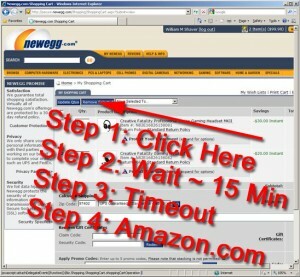 I love giving money to newegg, but today I can’t. 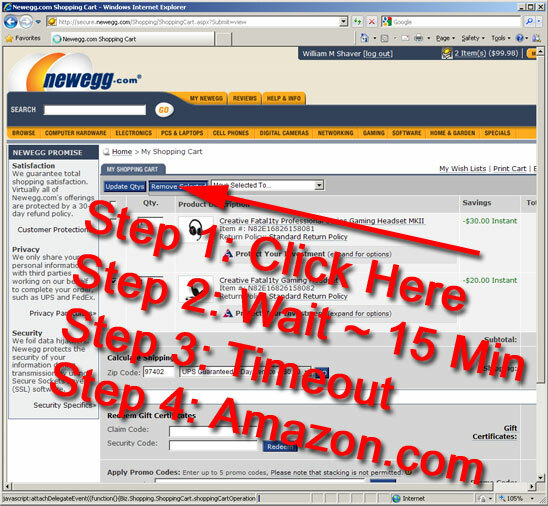 Seems that some combination of newegg’s shopping cart code and our corporate firewall prevent me from updating my cart. I can totally delete my cookies and start over, adding one item at a time to the cart. But today I wanted to order two of the same item, so I went to amazon. I’ll pay a little more, but at least then I can order them together. I’ve tried the hosts file trick mentioned in your faq. I’ve tried under Chrome, Firefox, and IE8. I’ve tried it in a house, I’ve tried it with a mouse. I’ve tried it on a different day, I’ve tried it in a different way. I’ve tried it from a different box, I’ve even tried it while juggling socks. Any ‘Update Cart’ operations timeout. After attempting to perform one I have to clear my cookies and start over. Level of technical experience: I help build the Internet. Thank you for contacting Newegg. I truly apologize for the unfavorable situation. Please kindly note that we are not technically certified; therefore we can not provide more information or suggestions about this problems. We do apologize if this causes you any inconvenience. Possibly this is a problem at the end of the item stock and we do not have available quantity for purchase. Again, I sincerely apologize for any inconvenience. If you have any further questions or concerns, please visit our FAQs page. If you still need assistance, please feel free to email me directly and I will be happy to assist you. So tell me dear readers – how does that relate to what I wrote? Even a little bit? So I wrote back, trying to pass this up the ladder to someone with a little more technical training. Somehow I think my humorous and loving note was lost on you. I gave my money to amazon.com instead. I do apologize for any inconvenience. This situation is not normal. I would like to further assist this issue on your behalf. Please reply to this email with the screen shot of the problem you met with purchase, I will send report for you. Fantastic. I was hoping she would send report for me. Here’s my screenshot. Enjoy. We’ll see if they manage to do something useful for me.